"From beginning to end I learned, laughed, was pushed and challenged. The instructors were personable, professional, and knowledgeable. ...I recommend this class "
- L.B. Mecklenburg EMS Agency, North Carolina. "Very fast paced, very informative, and learned a lot. Instructors were wonderful and very encouraging." - H.M. Jefferson County, Florida, Sheriff's Office. "One of the best all-around classes I have attended. No questions left unanswered. 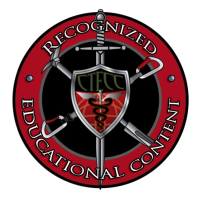 I will recommend this course to any medic that would be interested in tactical EMS." - M.G. TEMS Course, Florida Public Safety Institute. "One of the best skill labs and exercises I have been apart of in 20+ years of fire/EMS servise." - L.N. Gulfport Fire Department. "Very great training. Well planned. Very professional instructors. Really enjoyed the course as well as all of the instructors." - J.T. Florida Department of Law Enforcement. "Having the knowledge presented will be very helpful in real world situations." - E.B. Fort Pierce Police Department, Florida. "This class was way more intense than expected. The instructors are very professional. Every lecture was followed by "Hands-On" and also applied later in the week." "Every tactical medic should consider taking this course to help better prepare themselves and teammates." "This course was filled with high level training." - S.B. Ohio State Highway Patrol. "20 years in EMS and this was the first time I felt truly challenged. I truly feel that this week has been the best of my career!" - R.D. Norwich Township, Ohio Fire Department. "I will be a better paramedic and much more aware officer." - A.W. Truro Township, Ohio Fire Department. "Great course for the newest medic on the team, or even the most seasoned one. You WILL learn something." "Should be required course for all LEOs. Excellent course! - M.W. Sunrise, Florida Police Department. "This course is exactly what today's tactical operator needs. 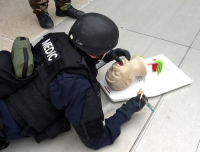 I would recommend this course not only for EMTs, but for all SWAT operators, as well." "I have been a civilian medic for 14 years, an Army Reserve medic for 14 years and a tactical medic for 3 years-this is one of the best classes I have ever been to." - J.S. Columbus, Ohio Fire Department. "Very impressed with all of the instructors. Very impressed with set-up at training center and impressed with course." - D.T. Department of Defense. "The intensity and content were beyond anything I had imagined." - R.W. Royal Canadian Mounted Police. "Outstanding class! Without a doubt you will learn new things. Should be the national standard for TEMS." "Excellent course for learning what will save lives in a tactical environment." - Anon. Martin County Sheriff's Office SWAT, Florida. "This was the most demanding, rewarding, most accomplished class I have ever taken in 12 years EMS. I am proud to have earned this certificate." “One of the best skill labs and exercises I have been a part f in 20+ years of fire/EMS service." 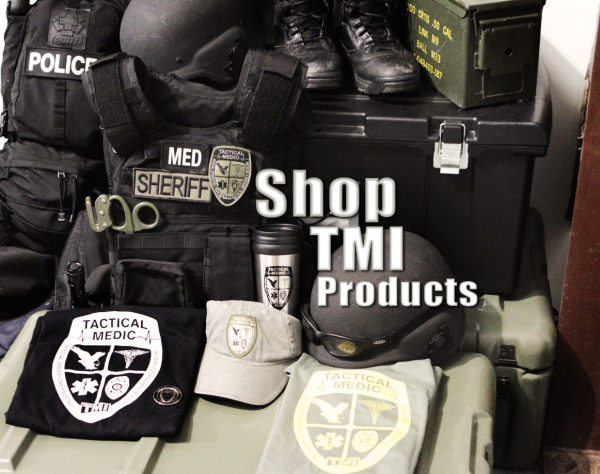 TMI specializes in tactical law enforcement medicine and military combat medicine, including tactical combat and emergency casualty care. 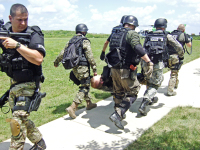 TMI offers training and education, as well as operational medical support for civilian tactical (SWAT) teams, the Department of Homeland Security, the United States Military, and Department of Defense contractors.